The High Court of Justice on Thursday partially accepted a petition against the Beersheba Municipality for refusing to allow Muslim residents to pray at an old mosque set to be converted into a museum. The judges qualified the museum's establishment but ruled it should be devoted to the culture of Islam and eastern nations. The High Court criticized the municipality citing a problematic perception of the Muslim population within the community. 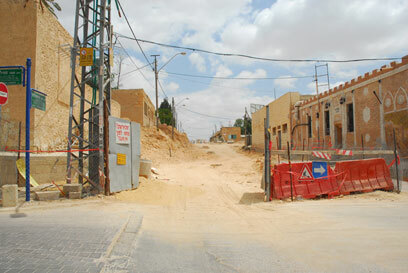 The Beersheba Municipality has long decided to turn the old mosque into a museum, however the Negev's Muslim committee and the Bedouin Rights Protection foundation petitioned against the decision in a motion to allow residents to worship at the site. The mosque, built in 1906 by the Ottomans, has not served for religious purposes since Israel's establishment and has been made into a museum in the 1950s. However, the site was declared a public hazard in the 1990s and after renovation work initiated by the city Muslim representatives demanded to be allowed to pray at the site. They petitioned against the Beersheba Municipality, the science, culture and sport minister and minister of religious affairs in 2002 claiming the establishment of the museum will hurt the residents' religious sensibilities. In 2006 an inter-ministerial committee concluded that the structure should maintain its capacity as a museum but also express the mosque's special architectural and historic features. The Supreme Court then approached the parties offering a settlement whereby the mosque will serve the Muslim community's cultural and social needs but will not serve as a place of worship. The Municipality rejected the initiative claiming "an active mosque in the heart of a Jewish city is unthinkable." They warned that the petitioners want to seize control of structures and territories out of nationalistic and radical religious motives and expressed fear the site will be used for protest and incitement. They further claimed the Supreme Court's compromise will harm public security. Judge Salim Joubran partially accepted the petition and ruled that a museum devoted to the culture of Islam will be established in the site. He noted that the municipality has the right to decide what to do with its public property but added that its claims against the Muslim public "raise a bad feeling." Beersheba Mayor Rubik Danilovich said in response: "We honor the High Court's ruling and a unique museum will be set up in the site which will cater to fans of culture and art from Israel and abroad." Director of the Adalah Center for Arab Minority Rights welcomed the ruling but regretted the fact the site will not serve as a mosque. "The city views Muslim prayer as an element of incitement. This is based on prejudices. The Supreme Court has set a precedent by ruling that the Municipality must respect the Arab minority in Israel," he said. See all talkbacks "Beersheba mosque to become Islam museum "